I was working at Terrybaun Pottery in Co. Mayo from 1974-1978. Emily was a neighbor in the Village. I loved spending the occasional evening at her house sipping Sherry in front of her fireplace. She told me she lost the love of her life in WW 1 where she was a nurse in the trenches. Then she became matron of Guys hospital in London in WW2. A student of hers was Haile Selassie’s daughter. she eventually had to return to Ethopia and marry someone in an arranged marriage. She died in childbirth. "Old Tom" lived in her house and took care of things. He always sat in the kitchen in front of the stove. back seat so as not to unbalance the car! I didn’t realize until later that I was with living history! My name is Christine Christofi (nee Davies) and I started Guys in October 1960. Our set has just had a reunion on the 7th of this month and although I was unable to attend I learned from someone who did that a great friend from our set had passed away a few years ago. There were few other details so I am wondering whether you or some other member could fill me in. Her name was Daphne Barnes and she came from Liberia and I believe she returned there after leaving Guys. She was a diplomat’s daughter and engaged to the Under Secretary For State for that country when we knew her. I would be most grateful for any information regarding her death. I am sorry to have to tell you that Joan Bywater has died. Joan has been unwell for some time and was admitted to hospital where she died on Friday 6th June 2014. On 24th March 2014 a memorial service was held in Guy’s Chapel in thanksgiving for the life of Barbara Norah Stevenson. service was attended by family, friends and colleagues and was arranged by Gwenivere Haylock and Julia Kealey. They had designed and produced a lovely order of service with details of her ‘full and amazing life’ as beloved family member, Guy’s nurse and midwife and member and officer of Guy’s Hospital Nurses League. Barbara began her training at Guy’s in 1939. The family, parents Win and Bob and brother John, had moved to London in 1928 and her father, a pharmacist, suggested Guy’s as a good place to train. After qualifying, Barbara trained as a midwife and spent her whole career at Guy’s retiring as Superintendent Midwife in 1975. Barbara, affectionately known as ‘Stevie’ by her friends and colleagues at Guy’s was an active League member. After her retirement she continued to be involved with the League holding many offices including Assistant Honorary Secretary, Chairman, Honorary Secretary, and Vice President as well as editing the League Journal from 1980 – 1993, She continued to sit on the Committee as Vice President for many years as well as attending and supporting many League events. 'Barbara was so much to so many people as a beloved daughter, a loved sister and to us all in the family as the most wonderful aunt who was so much more than most aunts can dream of being. 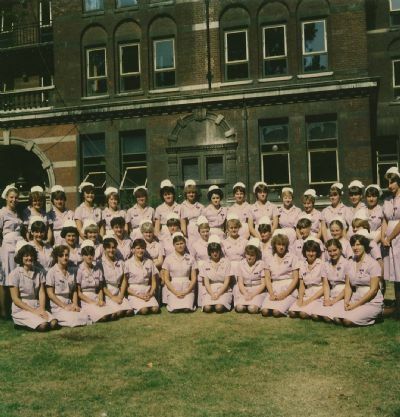 She was also a very talented nurse and midwife who loved Guy’s Hospital, all the people she worked with and the women and families she cared for. Her personality was so positive so full of fun and she was a very knowledgeable, well-read and interesting person to be with. She loved her time living in Sarah Swift House; Julia and Helen; her nieces came to stay often and had an amazing time being shown all the interesting buildings and unknown parts of London, which she took marvellous photos of. Trips to concerts, ballets, museums and the opera (especially Handel) were also wonderful and magical memories. After retiring as Superintendent Midwife and Head of the School of Midwifery she worked tirelessly for the Guy’s Hospital Nurses’ League. She was Chairman of The travelled widely in her role representing British midwifery all over the world as well as being adventurous in her holiday travel too. Holidays in her old age were with family and she never missed out on special events and was always game for joining in. She would go swimming in the sea with her grand-nieces and nephew and even climbed the Preseli Mountains in North Pembrokeshire in her late eighties. She was generous and helped with money when times were hard. She also supported those in the family with health problems by always being by their side and making sure they received the care they needed. All the family were so pleased that when the last meeting and celebration of the Guy’s Nurses’ League took place in 2010 it coincided with her 90th birthday. Accompanied by her nieces, Julia and Helen (on a baking hot day) she travelled up to Guy’s to join in with the service and lunch and was given a well-deserved standing ovation. Afterwards while taking tea in the Colonnade many friends, colleagues and ex-students of hers came to offer her their congratulations and to reminisce about their time together. She really loved and treasured the memory of that day. I moved to the U.S.A. in 1967. I worked full-time as a nurse, then nurse practitioner in women’s health, then health administrator, for 50 years until my retirement in October 2012. Along the way I obtained a B.Sc. in biology and an M.A. in health education from Columbia University. My last job was as Director of the Barnard College Health Services in New York City. After retiring I moved to Tarrytown, a village about 25 miles north of the city on the Hudson River, to be near to my daughter, son-in-law and two grandchildren. I attended the activities at the last meeting of the GHNL at Guy’s in July 2010 and met a few of my set, still recognizable after so many years. I also still have every one of the GHNL Journals from 1966-2010! So sad to know that Guy’s as we knew it is so radically changed.... but we must have progress. On Tuesday July 23rd this year, sixty Guy’s Nurses with their families and friends attended a luncheon at the House of Commons, sponsored by Simon Hughes, Liberal Democrat MP for North Southwark and Bermondsey. The guests assembled in Westminster Hall and those who wished were taken on one of three arranged tours of the House of Commons. All those who took advantage of one of these tours reported that the guides were very informative and the experience was very worthwhile. One lady had a fall during her tour and had to miss the lunch which was very unfortunate. Happily she has since recovered. The lunch, held in the Churchill Dining Room, was excellent and Simon Hughes spoke in his usual amusing way and mentioned that 2013 was the 30th anniversary of his election as an MP. He felt that the day had been such a success that we should repeat it in the near future. This idea was well received and attempts to investigate the level of interest will soon be underway. Following lunch, a group photograph was taken on the terrace outside the Churchill Dining Room. All the feedback from the guests was positive and everyone appeared to have a very enjoyable time. Report and photos to follow. Just a big thank you from Betsy Morley and me for the generous collection that was made for us on the day. My name is Angela York and I'm trying to trace a dear friend, Gill Bunch, with whom sadly I lost contact in the 1960s. We were in the same set at Guy's in October 1961. I left nursing & got married in 1963 and we moved to West Africa. I'm sure that Gill went on to qualify. My address is : 14 Hawthorn Terrace, New Earswick, York YO32 4BL (phone nr 01904 764803). Richard & I are still very happy together and we now have 11 grandchildren. I do hope you manage to pass on this information. I would love to get back into contact with Gill or at least to hear of some news of her. Guy's badge needed please - see message from Wendy! If anyone can help I would be most grateful. Please contact me: Wendy Pike, nee Posner, Jan 1975 set. Please see information in Benevolent section about the Edith Cavell Nurses' Trust whose benevolent fund is available to help nurses in financial difficulty. Also information about a book about nursing available for purchase. I have just been reading an account in the Barts Nurses' League News about a man who was a patient there during WWII. He emailed the Barts League and they linked him with a lady who had nursed him. It occurred to me that there must be such a league for Guys and that I might approach you to make such a connection. So, with the wonders of Google, I am writing this. I was a patient in Job Ward in 1957. I had Fallot's Tetralogy and Sir Russell Brock corrected it for me. I particularly remember Frances, a very young nurse who was black, very pretty and very kind. I would be glad to make contact with her or anyone who worked in Job at that time. has been trying to find a nurse who trained at Guys sometime between 1965 & 1970. Her name was Gillian Waddell and she was from South Africa and returned to South Africa after she qualified. I'm not 100% sure of the spelling of her last name. It may have been Wandle or Wandle. Please have a look at Alison Russell's fascinating record of all the kneelers in the Guy's Chapel. Scroll down the left side of this webpage to the sections entitled kneelers. The League is very sad to have to announce the death of Pam Jefferies, the League President on Friday 13th August in St Christopher's Hospice, Sydenham, South London. Donations in her memory may be made to the above Church or St Christopher's Hospice. We will be remembering Pam on this website in the next few weeks.